Pros: Beautiful singing, a great cast and, above all, a magnificent location. Cons: If you can find anything wrong with this show you’d be a real Scrooge indeed! Despite my yearly tradition of watching Love Actually, my love for Home Alone 2: Lost in New York and how much I look forward to the Doctor Who special, there can only be two stories that really sum up Christmas. One is It’s a Wonderful Life and the other is, of course, this classic: Charles Dickens’ A Christmas Carol. If you have somehow managed to make it through life without seeing, hearing or reading some incarnation of it, here’s a quick summary. 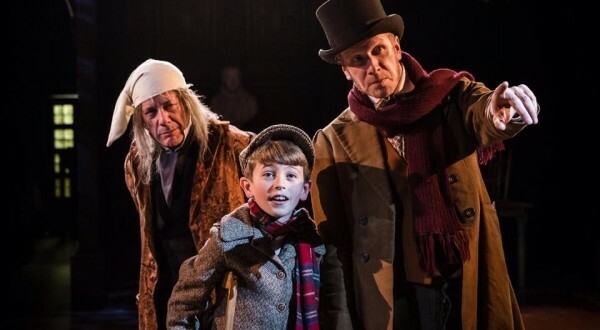 Ebenezer Scrooge is a bitter and selfish old man who, one Christmas Eve, is visited by the ghost of his former business partner and only friend, Jacob Marley. 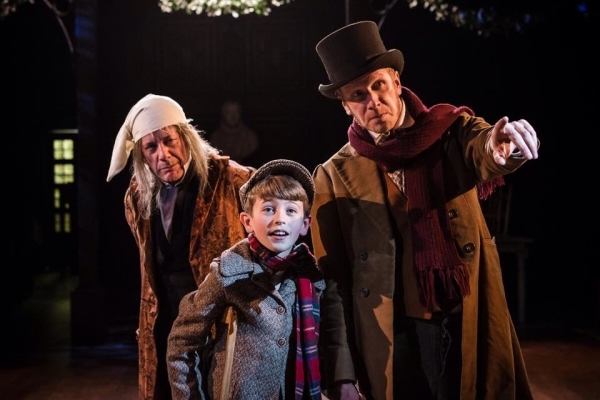 Marley tells Scrooge that he’ll be visited by three spirits who will help him change his ways, and that he’ll be cursed if he doesn’t comply. The ghosts of Christmas Past, Present and Yet to Come not only show Scrooge his younger, kinder self, but also how the people around him, including his clerk Bob and his nephew Fred, celebrate Christmas, attempting to make him embrace the spirit of Christmas once again. 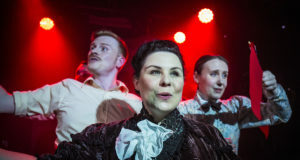 Antic Disposition has turned the story into a musical, appropriately using carolling favourites as the starting point for most songs. It’s a clever move that instantly gets you in the right mood for this magnificent production. 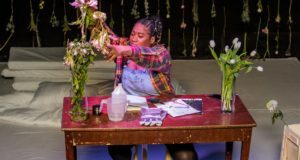 The cast are excellent singers whose voices fill the entire space effortlessly and their crisp enunciation provides that often elusive quality of being able to actually hear the lyrics in the ensemble songs. I’m always a big fan of live music on stage, so seeing the actors supported by real-life musicians was another great pleasure. The cast members are not only wonderful singers; the acting is good too. With less experienced actors the Victorian-esque language could have made this play a stilted affair, but instead the dialogues flow naturally. There’s a standout performance from David Burt as Scrooge, who, against your better judgement, makes you like the character from the very start. In the end though, even Burt is overshadowed by the magnificent venue of Middle Temple Hall where this production takes place. The 16th century hall is one of the oldest in London, and provides the most atmospheric backdrop you could possibly wish for. Designer John Risebero has wisely opted to let the location speak for itself, only using small props complemented by some awesome sound and lighting effects. The combination of all this with the music makes for such a magical atmosphere that you’d be forgiven for thinking you’ve walked into Hogwarts (which is pretty much the highest compliment I can bestow). Although this production is recommended for children over six, I wouldn’t say it’s much of a family show. Especially the younger kids will probably be more entertained by a good panto, or in any case something that involves more humour and more to look at in terms of costumes and sets. And at £30 a ticket (£20 for under 18s) this certainly wouldn’t be the cheapest family outing either. For anyone looking for some last-minute Christmas spirit (or a seasonal show without screaming kids in the audience) however, this is a wonderful festive treat. No matter how much you’re over Jingle Bell Rock, Christmas shopping and people dressed in themed jumpers, this show will make you wish it were Christmas every day.